During the excitement of planning and design, no one ever expects that one day their retaining wall might fail. Yet, some retaining walls may eventually begin to slide… or lean in a way they should not. Retaining wall failure is not something you want to think about… But any structure constructed by humans and exposed to the environment is fallible, no matter how hard we try. With proper (and usually professional) installation, maintenance and repair, a retaining wall’s life can be increased. No, it might not survive like the Great Wall of China and be visible from space, but it will surely serve its intended landscaping and aesthetic purposes for you to enjoy for years to come. Understanding the causes of retaining wall failure is the first line of defense to ensure that you won’t need costly repairs or replacement. When we talk about retaining wall failure, generally we do not mean that one day you wake up and the entire wall has tumbled down. This would be considered a catastrophic failure. Catastrophic failures of retaining walls do indeed occur in events such as earthquakes, floods and even high-wind damage. However, most retaining wall failure occurs gradually and over time. A crack here or there… or maybe the entire wall is sliding ever so slowly just a little bit each year. Add those years up, and your retaining wall could have moved significantly from its intended location. One thing is certain, once sliding or slanting start, there’s usually no stopping it without major repairs or replacement. As the name implies, a retaining wall is a structure that retains or holds the earth for which it was designed. It also adds contours and visually appealing craftsmanship to almost any yard. Many retaining walls are positioned on hills or slopes where the natural flow of water is downward. A properly installed retaining wall will have a drainage plan and system in place to allow the flow of water (usually rainwater) away from the base of the wall. An insufficient or damaged drainage system may cause rainwater to pool at the base of the wall, which creates a range of damaging effects. These can include additional pressure, and soil saturation and freezing and expansion of the water. 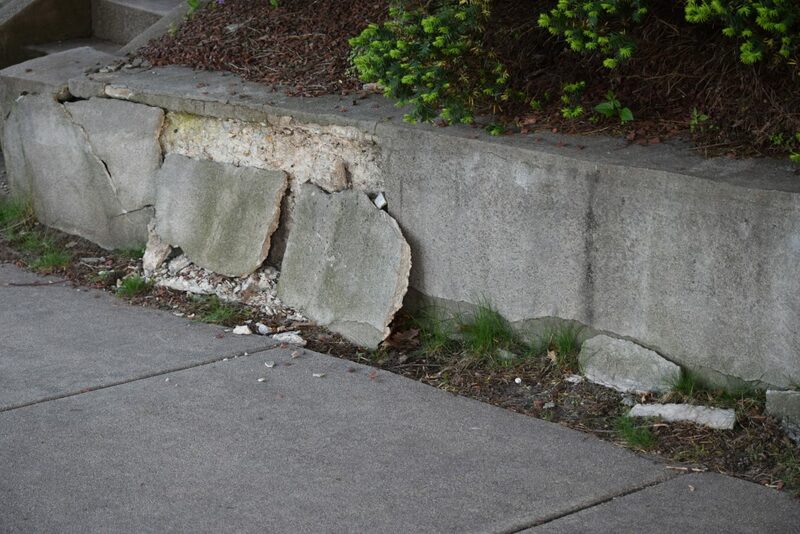 Water collecting at the bottom of a retaining wall is the leading cause of retaining wall failure. Proper construction of a retaining wall always takes into account the weight of the soil and trees either above or surrounding the wall. When constructed, a retaining wall will be durable enough to handle the load above it (i.e., most retaining walls are designed with specific and designated weight load capacity). Any additional or unexpected weight that is added above the wall will significantly increase the amount of stress and pressure to the retaining wall. For instance, over time, perhaps additional landscaping has occurred… or a new two-car garage was constructed… or a row of heavy trees was planted nearby. The additional and/or unexpected weight load may contribute to drainage problems, cracking, sloping and sliding. Any construction project is only as good as the foundation it is built upon. Retaining walls are no exception. Retaining wall foundations must be deep enough within the ground, and the soil must be properly compacted before installation. Also, understanding the soil composition, surrounding terrain, and the climate (ie. frost line issues and rainfall amounts) are additional considerations in building a retaining wall foundation that will stand the test of time. Faulty foundations may eventually lead to a cascade of problems from cracking, sliding, sloping to catastrophic crumbling. Many of the causes of retaining wall failure can be prevented by proper installation and professional construction in the first instance. Communicating with a landscaper (or possibly an engineer) about the expectations and uses of the retaining wall before construction begins will go a long way in making sure any retaining wall is safe, durable and long lasting. Cutting corners to save a few dollars in the short term might not be the best idea in the long term. The foundation, drainage, load expectations, climate, and soil composition should all be taken into consideration by a professional. Do it once, and do it right the first time. Exposure to the elements is to be expected. Retaining wall materials will expand in the heat and contract in the cold. Groundwater and rainwater can cause erosion over time. And extreme winds can surely damage a retaining wall. Again, these elements, unless extreme (ie. major flooding/hurricane), will not cause a sudden catastrophic failure of a retaining wall, but over time they can cause erosion, wear and tear. It should also be noted that the material a retaining wall is made of will also be a factor concerning its durability. For example, wood will rot over time and metal will eventually rust. Periodic visual inspection of a retaining wall is always recommended. Look for obvious cracks, breaks and fissures. Other inspections such as load capacities, drainage, sloping/sliding and foundation issues should be performed by a professional. Our blocks can transform any outdoor space into a unique masterpiece… The options are truly LIMITLESS. For everything you need to plan, design and build the perfect retaining wall for your next project, contact us today.